Business phone service for retail stores. Customer service and constant communication is part of the day-to-day grind for millions of retail workers and managers. With increased competition for shoppers’ attention, every detail must not be overlooked, and that includes the way you engage with shoppers and suppliers over the phone. Stepping up your game with an office phone system designed for the ins and outs of the retail industry can help you keep your communications consistent - which means more revenue and happier customers. What do retail stores need in an office phone system? Retail stores can vary widely in size in specialty, from local mom and pop hardware stores to large commercial chains. However, every store needs to ensure they have a way to organize and route calls appropriately, whether it’s about a shipment of goods that needs to be delivered to your store, or a customer calling about business hours and locations. Business owners might also need to manage multiple retail locations, meaning they might need to take business calls from the mobile phone. Having mobile access means your business can still look professional and polished, even if you aren’t behind the counter answering from the main line. You also need flexibility and easy transfers between your multiple retail locations. For instance, if a customer calls your downtown location, your staff should be able to easily transfer the customer to a store that has the product in stock. See how Ooma Office helped this apparel manufacturer become more productive and reduce phone bills by $1,000 a year. Ooma Office delivered exactly what we had hoped for. Find out how Ooma Office helped this pet supply store meet growing customer demands. Ooma Office helps my company sound more professional for customers, and is the ideal first impression for making sales. All-inclusive price: If you have many retail locations, you might be concerned about paying too much for multiple phone lines, extensions and add-ons. However, with Ooma, each account comes with local and toll-free number of your choice (you can even port an existing number), a virtual fax extension, and a conference extension line. No hidden setup fees, add-ons or surprises. Multi-level virtual receptionist: Route calls to the right retail location, and manage your inbound calls more effectively. Create business hours and afterhours settings and greet customers – this is the best way to help your company look polished and stay organized. Free toll-free and local number: Create a more established retail presence by choosing a free local or toll-free number. 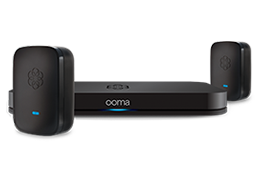 This is included with every Ooma account – we can even port over your existing business number. Mobile phone access: Great for retail managers with multiple locations, the Ooma Office Mobile App allows you to take calls from your business line on your smartphone. This way, you’ll never miss a customer or supplier call. Unlimited calling to Mexico, Canada and Puerto Rico: If you have retail locations outside of the U.S., Ooma offers free unlimited calling to the above countries, and low-cost international calling to many others. Easy DIY setup: With the Ooma Office setup, you can scale business phones at your retail locations quickly and easily with our convenient DIY setup. To see how Ooma Office can help modernize your retail space, check out our main business page to learn more about our features and benefits.